Etymology: from Greek pitta, "resin, or pitch" and sporos, "seed", allusion to the (sticky) resinous substance which coats seeds. "Tobira" is the Japanese name. Origin: Pittosporum tobira is native to China, South Korea, Japan. Other species are native to New Zealand (Pittosporum crassifolium and Pittosporum eugenioides which is a tree that can attain 13 m tall). Habitat: sunny position, half-shade, but fears severe colds, rich soils. Adapted well to Mediterranean climate. It resists spray, strong temperatures, drought. Pittosporum tobira: zone 7 (it supports cold until -17 °C or 1 °F). It is met on the coasts of the Mediterranean sea, as well as on the Basque coast. Pittosporum heterophyllum: zone 8 (it supports cold until -12 °C or 10 °F). Pittosporum tenuifolium: zone 8 (it supports cold until -12 °C or 10 °F). Size: 2 - 7 m tall. Shape: in dome. Exposed to the violence of the coastal winds, it resists and models itself "in flag". Leaves: persistent, obovate, acuminate, green-dark, shining. From 5 to 7 cm long. They are almost sessile (no petiole). The midrib is very marked. They are grouped in whorls. Flowers: white or yellow lemon, petals, 5 mm in diameter. They are fragrant and bloom from May to June Their heady scent evokes that of orange. Other species have red or purple flowers (Pittosporum crassifolium). 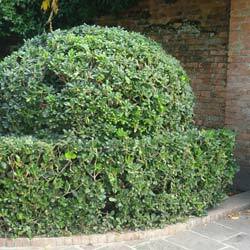 Use: in free form (it forms a big shrub trimmed with leaves in its upper half) or in pruned hedges. Pittosporum indeed supports very well pruning, even strict. Seeds of Pittosporum crassifolium, it is possible to extract a blue tincture. The plant is rich in saponin. Pittosporum eugenioides produces a resin, by incision of the bark. The resin is used as a chewing gum.